The dark green prototype has been lapping the handling circuit at the Motor Industry Research Association proving ground for a while now, the distinctive bark of its 3.4-litre straight-six motor bouncing off the steep walls of the banked track that encircles this place. You can see the precision of its line through the corners, the crispness of each gearchange and you want it to go on. But it can’t: time is pressing and rain clouds are gathering, so reluctantly we call the car back to the apron where we’ve all been waiting. The ‘here’ we know about; the ‘her’ is the original prototype Jaguar D-type, chassis number XKC401, registration OVC 501. A barely believable 60 years ago, he, her and here came together to commence a programme that would result in the most beloved and revered sports racing car ever to emanate from these shores. I’ve always pondered that part. For a car that as a full and proper works entry only ever won a single round of the World Sports Car Championship, and that only after the withdrawal of a rival team that was leading the race by two clear laps, the Jaguar D-type occupies an astonishing place in our hearts. Even if you add private entries, the count rises to just four wins. Chuck in two non-championship victories in the Reims 12 Hours and you can say that, in the five years the D-type can be said to have been a contemporary racing car, it won just six important races. And yet there in our hearts it lies, and my question, which I’m hoping Norman will help me answer, is how it got that way. It is interesting to note in this modern era, where Porsche announced its return to Le Mans fully three years before the actual race, Norman first got his hands on a functioning D-type barely two months before Le Mans – and with Jaguar having won two of the last three races there, it was expected to succeed. Perhaps more startlingly, two months before that the car did not even exist. 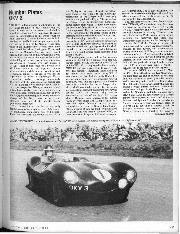 But here at MIRA in April 1954, Norman Dewis began the process of getting the D-type – this actual D-type – ready to race. That it was possible at all was down to a number of winds blowing in favourable directions. For one there was a first-class team on the job, from staff at Jaguar in charge of the mechanical parts to Abbey Panels, who were responsible for the body. This meant components were made on time from accurate drawings – and when fitted to the car, they worked. Secondly, some very well known and proven parts lay inside the genuine design revolution that was its concept and construction. Finally that concept, developed with none of the knowledge or equipment we’d now take for granted, was as close to flawless as anyone could have hoped 60 years ago. Not that there weren’t a couple of false starts. 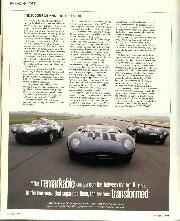 Because the C-type was still so competitive in 1953, and the D-type damn near won Le Mans in ’54, it’s tempting to think one flowed naturally into the other, especially as so much of the D-type (including its front and rear suspension design, rear differential and, of course, engine) was based upon, if not identical to, parts of the C-type. Not so. Post C-type, the first alleged racing car produced by Jaguar sheds light on practices that seem inconceivable today. In essence, in early 1953 Jaguar boss Sir William Lyons designed and built a new car without the knowledge of either his chief engineer Bill Hayden or race team manager Lofty England. An extraordinary-looking device with fared-in wheels front and rear, when it finally broke cover it soon gained the only name it would ever have. And if calling the car the Brontosaurus was not enough to seal its fate, its enclosed front wheels ensured a steering lock so bad the project was shelved and the car dismantled long before Norman had time for more than a few cursory tests. The next car, however, was far more serious and was even accorded a proper prototype name. Today XP/11 is referred to by Norman and others as the C/D-type and that is probably how it should rightly be seen. Built after the Brontosaurus but before the C-type’s final triumph at Le Mans in 1953, XP/11 was constructed around a hybrid monocoque/spaceframe chassis, the former previewing the game-changing design of the D-type, the latter made up not of simple steel tubes like the C-type, but an exotic magnesium alloy. Mechanically it was similar to the ’53 specification C-type, its body visually the missing link between the C and D. Norman and others (including Stirling Moss) tested it extensively and, while it proved capable of circulating Reims at lap-record pace, even before the end of the year its design had already been superseded by that of the even more aerodynamically efficient D-type. 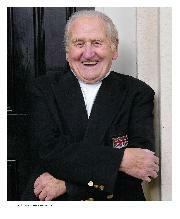 According to Paul Skilleter’s masterly biography of Norman (Norman Dewis of Jaguar – Developing the Legend), XP/11 survived until towards the end of the decade, whereupon like most obsolete prototypes, it was broken up and destroyed. But not this one. Looking at XKC401 now, it is not difficult to unveil its design secrets, for in truth there weren’t many. The double-wishbone front suspension was carried over with very few changes from the C-type and the same can be said of the live rear axle, the only design aspect of the D-type that can be said to be truly outdated. It used the C-type’s limited-slip differential and, of course, the disc brakes that had given Jaguar the decisive advantage at Le Mans in 1953. 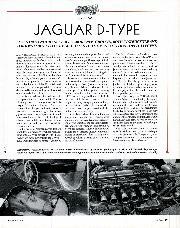 The engine received a further upgrade, including three twin-choke 45mm Weber carburettors and dry-sump lubrication, but was still essentially the same 3442cc twin-cam straight six from the C-type, itself a development of the road car engine designed for the XK120 that had first run not long after the war. The only major mechanical component that could claim to be genuinely new was the Jaguar-designed all-synchromesh four-speed manual gearbox, which was both quicker and easier to operate than the C-type’s slow and cussed Moss ’box. The D-type was built this way because Jaguar was not in a position to develop an entirely new prototype from scratch and, even if it had been, you sense the company would still have chosen to stick with those proven components. What was needed was a new structure and shape that would allow that work to shine more brightly. Even in 1954, monocoque construction wasn’t new: the Lancia Lambda had it in the 1920s and aircraft had been built that way for years. But in the world of sports-racing cars still easing its way from body-on-chassis construction into the newfangled world of the spaceframe, it was years ahead of its, or even Formula 1’s time. The Grand Prix circus would have to wait until 1962 and the Lotus 25 for its first full monocoque car. The D wasn’t that because its aluminium tub only accounted for the centre section. But even what has been called a semi-monocoque ensured the D-type was all those things chassis engineers want most: stiffer, lighter and stronger than what went before. The D-type had another vast advantage over the C-type, one too often overlooked by history. As the finishing touches were being applied to XKC401 in the spring of 1954, the same was happening to MIRA’s brand new Proving Ground. While there already existed a track at Gaydon and runways had allowed cars to get near their top speed, they could only do so fleetingly. But at MIRA, with its 2.8-mile track comprising three straights linked by curves banked to up to 33 degrees, the D-type could pound around until the tank ran dry at average speeds far in excess even of those required to win Le Mans. It could also be used for durability and fuel consumption testing. Norman says the fastest lap he ever completed in a D-type – admittedly in ultimate long-nose, 3.8-litre configuration – was 155mph. MIRA also had a handling circuit, so the car could be developed on one site almost in its entirety. But it still needed to be tested at Le Mans, made possible in May because the roads had been closed to host a local rally. Driving XKC401, Norman took five seconds off Ascari’s lap record set the previous year in a 4.1-litre, V12 Ferrari 340MM. According to Duncan Hamilton’s Touch Wood, Tony Rolt lapped the winning C at 111mph, some 8sec slower than the D-type you see here. 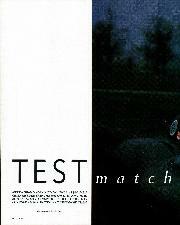 The car’s inexorable test programme continued, with drivers such as Stirling Moss, Rolt and Peters Walker and Whitehead all using the prototype to get their eyes in. Not all of them liked it, Stirling in particular always preferring the handling of the softer C-type, but none was under any illusion as to how much faster it was. It was not XKC401’s fate to race at Le Mans or anywhere else, which is what allowed it to be preserved by Jaguar Heritage in time-warp condition. Instead it was the next three chassis that travelled to France. The race was run in deteriorating conditions that you might think would favour the lighter D-type relative to the 4.9-litre Ferrari 375 Plus that the Scuderia fielded to fend off the threat from Coventry. Not so, says Norman. Not only were the Ds affected by misfiring, the weather kept the Ferrari’s drums cool, negating the advantage of the D-type’s discs. Two of the three Jaguars retired, leaving Rolt and Duncan Hamilton to chase down the Ferrari’s lead. They damn near did, but an encounter with a sandbank – avoiding another competitor – added up to too much work for such a new car. At the flag it was fewer than three miles behind González and Trintignant, after more than 2500 miles of racing. Happily the D’s first big win was just three weeks away. All three Le Mans cars entered the Reims 12 Hours and, while one retired, the other two came first and second, with a private C third. The nearest Ferrari finished nine laps adrift of the winning Jaguar in fourth place. It is, in fact, no surprise that the D-type is so revered today. Its beauty alone would ensure star status. You can argue about its competitiveness on the world stage, but at the most important sports car race of all it very nearly won first time out, and then won the next three on the bounce. Yes, that first win was gifted by Mercedes-Benz’s withdrawal and the next two achieved by private cars, but the record books aren’t concerned with such details. The Jaguar D-type remains the most successful British sports car to take part in the only sports car race to become a household name. And it was work done by this car, on this track, by this driver, that delivered the D-type to France ready to get the job done. It seems appropriate that my chance to lap MIRA’s high-speed circuit coincides with appalling weather: it would give me some idea of one aspect of what Messrs Rolt and Hamilton endured at Le Mans in ’54. Its provenance surely values this D in the tens of millions and I can hardly believe Jaguar Heritage is even going to get its bonnet wet, let alone permit me to drive it fast, but that seems to be the case. The cockpit is comfortable with more legroom than a C-type and a lower driving position, too. The ambience of a C-type cockpit is that of a fast sports car, while that of the D is pure racing car. To me that is one of the biggest differences between them. Turn the key, thumb the button and the twin-cam six replies enthusiastically, but discreetly. The engine is still standard, which means about 265bhp compared with the 350bhp it’s now possible to extract from the 3.8-litre version of this engine. The rain’s bouncing off the body as the car accelerates smoothly onto the track it first visited 60 years ago. The power band is wide and, with less than a tonne to push, the D feels properly fast. Jaguar has imposed no limits, nor does it need to: all that matters is that this car’s unbroken, uncrashed history continues. MIRA’s straights are long enough to feel how little drag its shape offers but, more relevantly, just how well balanced the car is at high speed: it tracks like a modern car. Norman’s technique was to barrel down these straights at more than 160mph, backing off to 130 for the banking before powering through the curve. Mine is to ease very gently on and off each pedal, doing nothing that might upset the car. I soon learn the best place to be on the banking is right at the top, where it’s steepest and driest. I’m not sure how fast it’s going because I daren’t look down, but it’s fast enough to feel the car working, settling on its torsion bar springs, getting down to business as if it’s never been away. I do four or five laps then quit while we’re both still ahead. I try to think like Norman as I kill the engine, coast to a halt, push my goggles up onto my forehead and try to make some comment. But no words come: not only am I cold and wet, I’m stunned by what I’ve been allowed to do. They were made of sterner stuff back then and none more so than Norman Dewis, the man among whose many achievements was to turn the D-type from a good idea into the greatest Le Mans car this country has yet produced.